Do you have legal standing to sue your lender for financial compensation for fraud, clear and marketable title to your property, or both? Now you can save time and money suing for quiet title or wrongful foreclosure with FRAUD STOPPERS PMA membership & turnkey lawsuit / evidence package. Federal Truth in Lending Act (TILA) Rescission Letter – that can overcome the 3-year status of limitations, so you can rescind (cancel) your mortgage loan contract using the power of federal law and the groundbreaking United States Supreme Court Case Decision Jesinoski v. Countrywide Home Loans, Inc.
Legal Information Is Not Legal Advice: This site provides “information” about the law and is only designed to help users safely cope with their own legal needs. But legal information is not the same as legal advice — the application of law to an individual’s specific circumstances. THIS SITE IS NOT INTENDED TO BE MISCONSTRUED AS LEGAL ADVICE. 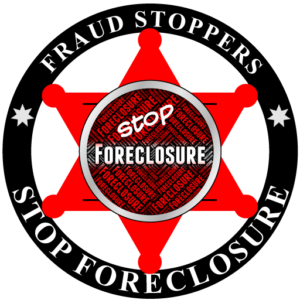 Fraud Stoppers is NOT a law firm, non-profit organization, or government agency. Register for your Free Mortgage Fraud Analysis and Securitization Search, and get Free Foreclosure Defense Help and Free Foreclosure Defense Documents that you can use to stop a foreclosure and save your house.